I am pedaling steadily down the long, straight pavement of Old Highway 63. 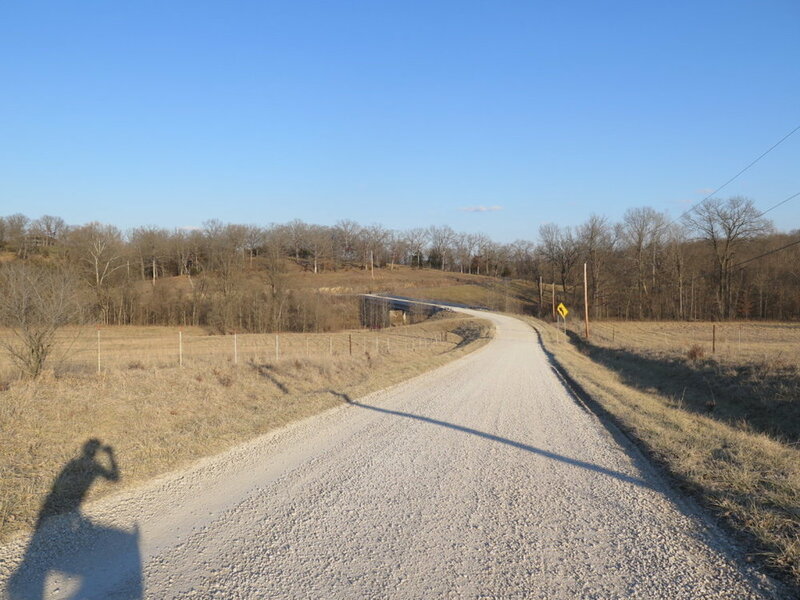 I’m on my way out of Ashland, MO, on an unseasonably warm winter day, and feel eager to touch tires to the tamped down “gravel highways” that come with the winter season. The highway service hasn’t yet coated the roads with fresh gravel and, without a dearth of snowfall this winter, country roads are smooth as a banana peel. This is the “transport stage” of my ride—in which I hurry my pace to reach more desirable pathways—and a brief handful of miles later Christian School Road transitions from asphalt to a gentle downward gravel grade—the best part of the ride has begun. Passing Jemerson Creek, I curse the shorter daylight hours. It would be a joy to extend the ride a bit and climb up to Cedar Tree Lane—which, headed west, boasts one of the most exhilarating descents south of Columbia and north of the Missouri River. Entering Hartsburg, I soft pedal and enjoy the warmth of the bright winter sun. The Katy Trail is soft like warm butter, but smooth, and is a joy despite its sogginess. My anticipation continues to build as I turn off the trail to Soft Pit Hill, and at the top of its granny-gear justifying climb I enjoy a banana in the sun while a local dog barks from the edge of its property. I am on some of my favorite roads, en route to my “favorite road”, and it’s a wonderful day to be on the bike, especially in early February. Soft Pit rewards with a gentle stretch of blufftop pavement, and an ensuing descent that flattens on its way northward to Claysville. In season, the Claysville Store caters an impressive plate of fried chicken, and I can’t wait to ride out as soon as it opens. I’m not yet to my favorite road, but the ride is fantastic this close to the river. Small homes with gardens and goats emit smoke from leaning chimneys, and a group of younger men gathered around a four wheeler wave with characteristic midwestern warmth. Just past Claysville, I access the trail, and via a short, private stretch of dirt, I find myself nearing Highway 63. The highway is easily crossed, and I’m at my favorite gravel road, County Road 397. This past spring, after meeting some buddies for brunch at Dotty’s in Hartsburg, I broke a spoke on the elicit double track I took from the Katy Trail to County Road 397. Even with the nagging mechanical my enjoyment of this choice gravel road was not diminished. County Road 397 incorporates two large climbs, both of which reward the rider with long descents, descents with long lines of sight that allow the experienced gravel cyclist to rip down them without thinking about touching the brakes. Today, without a thought of “training” in my head, I climb in an easy gear and rest at the top of the first climb to hydrate and enjoy the view towards Jefferson City. Mindful of the shorter daylight hours, I cap my bottle and spin along the hilltop, past a gaggle of white cows that slowly stare at my lyrca-clad visage. Before long I’m blazing down the hill, pressing my back flat to gain speed and gleefully unweighting the bike over potholes and washboard sections. I’m headed north, and as I bomb the hill I make a mental note to reverse this route come Spring. Headed northward on 397, this descent becomes a set of stairsteps, with three short climbs interspersed with flat sections. A long, flat straight rewards my brakeless descent with a half mile of twenty mile-per-hour plus coasting, and the road curves gently between hewn rock and Cedar Creek. Before I know it I’m climbing again, a long slow grade with a pack of dogs at the top. On past rides, I’ve sped northward past these german shepherds in anticipation of the coming descent and wary of their potentially unfavorable canine nature. Today, I’m in the gambling mood and come to a stop. The dogs prove friendly, and their timid approach is rewarded with some head-scratches and kind words on my part. A small terrier with a lame hind leg and one eye stands to the side and barks resolutely, stubbornly refusing to sniff my outstretched hand. The daylight is failing, but it’s still warm, and I take a break to straddle my top tube and enjoy the dog’s company. At this point, County Road 397 is done. It’s maybe a handful of miles long, but its topography makes it a local gem. I’m glad to have made it my destination today. The road is still bathed in sunlight, but I leave the dogs so I can make it back before the failing daylight brings uncomfortable temperatures. The rest of the ride is immensely enjoyable. County Road 397 runs into 389, which, headed northward, begins with a fun descent and, in the spring, meanders through beautiful green fields traced with thin cow trails and wide creek-bottoms. I will follow 389, which turns into Burnett School Road, all the way to Route Y, which will lead me back to the car at Ashland. This stretch of gravel is beautiful, and worth its own post, but this section of my ride is spent with an eye on the clock, and it passes quickly. Burnett School is a road Cedar Cross riders will know from its somewhat-sketchy wooden bridge and triplicate creek crossings. Today, I focus on getting home to food. I pedal over the bridge, through the winter-dry creek beds, and up a short hill to Route Y, which is a truck-harried blur into Ashland. On the drive back to Columbia I devour a tall order of french fries. I spent the day anticipating Country Road 397, and loved the opportunity to ride it in late winter with comfortable temperatures, but primarily the experience has whet my appetite for the coming Spring. The regional gravel scene has exploded, with a plethora of choice gravel rides and races scattered throughout the state. I’ve already registered for several, and after my ride I plan to register for more. I’m chomping at the bit for a beautiful Spring spent grinding Midwestern macadam roads. Gravel season is just around the corner, and it’s gonna be a good’n. We’re currently looking for full and part-time employees. Previous retail experience is preferred and interest in cycling and outdoor activities is a MUST. Please email sarah@waltsbikeshop.com or stop by with a resumé and we’ll be in contact! The 2016 edition of the BOCOMO Fondo will be May 14! More information soon. Better start getting ready, gravel season is right around the corner. We'll be open from 10am-3pm on Christmas Eve. Enjoy the holidays! It's time again for our annual holiday sale! Stop by the shop from December 3-6 and check out the deals. And don't forget about our customer appreciation night December 2 at 6pm. 20% off on all in stock full suspension mountain bikes! 40% off closeout road bikes! 20% off previous model year Salsa fat bikes! Receive a gift card with the purchase of any current model year bike. Earn up to $200 on accessories! It's that time of year again! Join us on December 2 for food, drinks, and general debauchery. We'll have Logboat on tap, music by Zorya, and a few other surprises. Then join us afterwards at Günter Hans for the after party! RSVP here. Dear Walt’s Customers, A number of bicycles sold between 2000-2015 were equipped with a front wheel quick-release lever that opens past 180°. If the quick release is improperly adjusted or left open, the quick release lever can become caught in the front wheel disc. If this happens, the front wheel could separate or come to a sudden stop and the rider could lose control of the bicycle. This only pertains to bicycles equipped with disc style brakes rather than traditional rim brakes. For the model year 2015, Trek did a running spec change to a different quick release with a lever that cannot contact the front disc brake assembly when open. That means that some of our 2015 model bikes may be affected. Furthermore the CPSC and the Bike Product Suppliers Association have more recently agreed to participate in the voluntary recall to cover all other major bicycle brands in the US in addition to Trek. 1: Inspect any disc brake bicycle you own and determine whether the front quick-release mechanism is affected. If you have questions regarding the recall you may call us for explanation or bring your bike in for an inspection. 2: If your front quick-release is recalled and you purchased your bicycle from Walt’s or it is a brand we currently sell regardless of where you bought it, we will replace it free of charge. If you own a bicycle brand that is not currently sold through Walt’s, we can sell you a new quick release if desired. 3: Learn how to properly use a quick-release. The video link below shows the proper quick-release procedure. It is also a good idea to move the quick-release handle to the non-disc side of the hub to eliminate any potential problems. Walt’s Bicycle, Fitness and Wilderness Co. While many of us spent our weekend racing in Hermann, MO Cooper, Tyler, Brian, and co. spent the weekend riding out to watch the races. Here's a report: Words and photos by Cooper. We meet at Ernie’s for breakfast at 7:30 a.m. Tim and I are first, and we take a table outside while we wait for the other half of our group to arrive. Shortly later, Tyler and Ryan roll up on their bikes. They’re riding with all of their camping gear, whereas Tim and I have decided to take advantage of our car-driving friends and have our gear sagged down to Hermann. Breakfast is consumed quickly. My stomach is waking up slow and it’s hard to fill up. Ryan reveals he thought we were going to take the Katy Trail, not the roughshod mixture of county highways and crushed limestone roads we have planned. We leave by 8:45, the tables are full of college kids and their parents fueling up for a game day we are all too eager to escape. The first 35 miles, the transport stage, goes quickly. 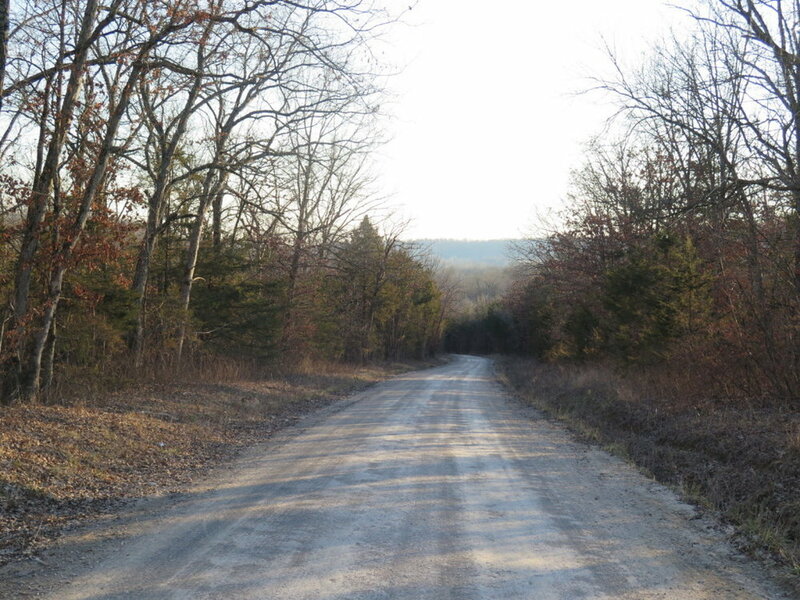 We navigate a set of out of the way roads and Mark Twain National Forest gravel that are familiar to us by now. We alternate attempting to ride and pushing our bikes up a muddy hill at the end of Englewood Road that provides a shortcut through the national forest land. Stopping briefly at a gas station in Fulton, we bob to some funky music playing through the outdoor speakers. A glass jar full of fried chicken and mashed potatoes is eaten, jokes are cracked, and the sweet lil’ ole’ lady behind the register tells us to ride safe. The gravel roads east of Fulton, being flat, straight, and relatively smooth, pass surprisingly quickly, and the transition from what-we-are-used to to holy-heckin’-hills begins. The big hills begin about 25 miles outside of Hermann, with a handful of climbs in the last ten miles that make it hard to fathom how Tim and I rode out here to participate in the Hermann Gravel Challenge this past spring. The hills are long, slippery grinds, paved with what Tim describes as “powdered sugar and baby heads”. Gaps begin to form between Tim and I and the other, fully loaded, half of our crew. The hills of Hermann are intense, but the countryside is equally intense in its beauty and the descents are ripping fast. Even though our legs are tired and our stomach’s grumble, we bomb the last hill to the trail and cruise into town in high spirits. We quickly search out beer and clean clothes, and join the Walt’s Team to heckle and cheer on the cross racers at the stairs. I blow a vuvuzela until my lips are numb, and with the finish of the A’s race our posse shuffles off to a fat dinner of buffalo wings and fried food. On Sunday I wake up at 7:30 a.m., feeling slightly discombobulated from last night’s beers but with surprisingly fresh legs and an empty stomach. A small but brave part of our group spins across the road to Hardee’s to choke down a greasy breakfast. While tents are put away we talk of the ride ahead, which packs nearly five thousand feet of climbing in the first fifty miles. Tyler’s struck with the serious beginnings of a head cold and Ryan is heading down the river to visit family. In normal circumstances I’d be bummed out to lose half our crew, but our numbers are bolstered by Brian, who has the day off and is fresh to ride. Our trio pedals out of the park past racers warming up bodies and carbon rims for a full day of cross. Our kit is different, but no less purpose-driven, flannel shirts and enormous saddlebags stuffed with food and extra water. The first part of the day’s ride is similar to yesterday’s, with powdered sugar dusted hill climb after hill climb. On the south side of the river the forests seem more dense, and at the top of each climb is a level path with a smattering of century farms and long distance river valley views that put the Columbia area Eagle Bluffs to shame. My legs are tired, but it’s impossible to not be inspired by terrain like this, and we find ourselves laughing absurdly as we granny gear our way up wall-like grades and dodge six inch ruts and rocks the size of dinner plates on the way back down. The planned route is touch-and-go, and we make some changes on the fly to abbreviate the ride to Jeff City. When we arrive in Osage City, Tim and I are tired, but remain fully stoked. Brian’s knee is bothering him, and while we celebrate to see the Jeff City city limit sign a few miles outside of Osage City, it seems like a cruel joke when we are still approaching our food stop over half an hour later. Prison Brews provides plentiful water and fat burgers to fill our stomachs and buzz our brains with red meat endorphins. Brian’s knee has put him out of the running, so Tim and I are the last men riding when hop back in the saddle and slow pedal across the Missouri River bridge. On the ride into Jeff City we evaluate our options. Riding the Katy Trail the entire way back home is considered as a mere courtesy—our millenial-grade attention spans are too short and our butts unconditioned for forty-plus miles of flat path. Our second idea is to take the trail towards Hartsburg, and cut through Ashland back to town. This option is discounted on the same grounds as the first; too much trail riding. We settle on what seems perhaps the craziest, but also the most fun—use the Cedar Cross course to head north. Rolling northward, I’m beginning to feel the trance-like tunnel vision that encroaches towards the end of an epic ride. Four years of Cedar Cross have imprinted the course map in my brain like a petraglyph on a cave wall. Before we know it we are past Holt’s Summit and opening cattle gates into a single-track shortcut. We gently herd cattle out of our way in one field, and in the next are informed by some whiskey sipping, cigar smoking horseback riders that we are most certainly going the wrong way. I’m confident in our route, and in no time we’ve cleared the last bit of single track and surfaced on a gravel road. I’m a bit sad there’s no shirtless Bob Jenkins to see me on my way. The last few miles—another transport stage—pass quickly. Tim and I have a solid riding dynamic, and we cruise back to town on the same roads we left on just the day before at a swift pace. We cross highway 63 in the failing sunlight, and we make it to Gasless to buy celebratory beers just before the sun sets in Alley A.